Aquilegia (ak-wil-leej-ee-uh) or columbines are among the most familiar and beloved flowers to grace our gardens in spring and early summer. There are approximately 65 species in the genus, most native to northern temperate and alpine regions, and countless hybrids exist. Sturdy, long-lived perennials, that once established, will persist and multiply. Graceful blooms, often with prominent spurs in many colors, nod above blue-green, divided foliage. Plants produce showy flowers in many shades of purple, blue, lavender, red, pink, yellow or white. Most also have nectar spurs that can be up to 6 inches in length on some species. Aquilegia tend to be short-lived but they hybridize and self-sow freely. They will do best in part shade, in rich but well-drained soil and are hardy to USDA cold hardiness Zones 3 to 8. Columbine is easy to grow in a wide range of soils except for heavy, poorly drained soggy soil; but prefers loose, average to rich, moist, well-drained soil. They can be grown in full sun or partial shade, though light to moderate shade will prolong flower season. Remove flowering stems after bloom to encourage additional bloom. Among the indispensable standbys if the flower garden, the species are variously effective in the rock garden, the perennial border, with bulbs and in the wild garden; useful as a cut flower as well. In the fall, or if foliage declines, plants can be cut back to their basal foliage. In the spring, remove only the dead leaves. Leaf miners are the only significant pest, if seen, simply cut the foliage all the way back to the ground and discard it. Healthy, new growth will emerge quickly. 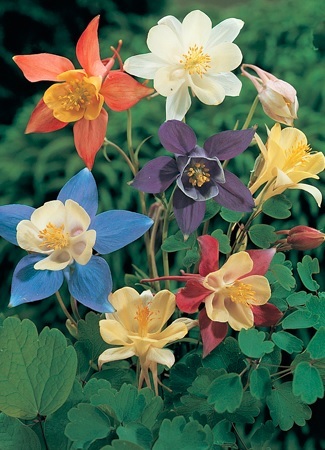 Some columbines may self-seed or cross-pollinate in the garden under optimum conditions. Do not propagate by division; mature plants do not like to be disturbed. Attributes: border plants, containers, cut flowers may last up to 2 weeks, edging and mass planting. Attracts butterflies and hummingbirds, Rabbit resistant. PLANTING: Set plants 12 to 15 inches apart. Choose a soil that's fertile and well-drained, but moisture-retentive. In the cooler regions of the north, full sun is fine, so long as plants receive ample moisture. Farther south, partial shade is preferred. MAINTENANCE: Water well during periods of drought. To prevent interbreeding, remove seed pods when they appear. If foliage becomes unattractive by summer cut it back to ground level; it will regrow in a very short period of time to continue its delicate display until frost.